Total Ankle Joint Replacements have progressed since the 1970’s as a treatment for severe, end stage ankle arthritis. This surgery is a technically difficult surgery and is only performed by experienced foot and ankle surgeons. 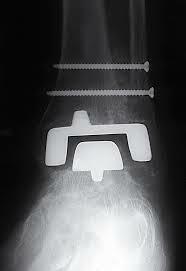 Proper patient selection is key for a successful outcome of a Total Ankle Replacement (TAR). 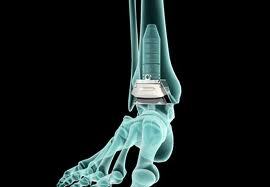 What does a Total Ankle Replacement Do? Attempts to replicate the original joint junction, which is limited by severe arthritis. Who are candidates for TAR? Studies on the current designs of TAR have a 5-10 year survival rate of the implant before the patient progresses to a ankle fusion, or arthrodesis. These implants have many ongoing studies and new designs and upgrades are being made. If you have severe ankle arthritis and ankle pain, contact one of the surgeons at Academy Foot and Ankle Specialists to see if a Total Ankle Replacement is right for you.